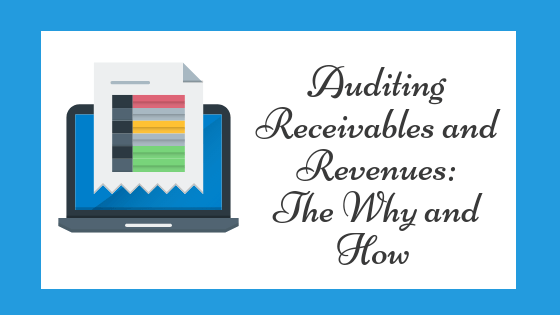 Today we take a look at auditing receivables and revenues. Revenues are the lifeblood of any organization. Without cash inflows, the entity may cease to exist. So, it’s important that each business generate sales or some type of revenue. For you, the auditor, it’s important to verify the revenue. Along with revenues, auditors need to prove receivables. Why? Some companies manipulate their earnings by inflating their period-end receivables. When trade receivables increase, revenues increase. So, a company can increase its net income by recording nonexistent receivables. In this post, we’ll answer questions such as, “should I confirm receivables or examine subsequent receipts?” and “why should I assume that revenues are overstated?" Accuracy comes into play if the customer has complex receivable transactions. Additionally, the cutoff assertion is often relevant, especially if the client has incentives to inflate the receivables balance (e.g., bonuses triggered at certain income levels). Second, think about performing your risk assessment work in light of the relevant assertions. Are receivables subsidiary ledgers reconciled to the general ledger? Is a consistent allowance methodology used? What method is used to compute the allowance and is it reasonable? Who records and approves the allowance? What controls ensure that revenues are recorded in the right period? Is there adequate segregation of duties between persons recording, billing, and collecting payments? Who reconciles the related records? What software is used to track billings and collections? Are there any decentralized collection locations? When are revenues recognized and is the recognition in accordance with the reporting framework? What receivables and revenue reports are provided to the owners or the governing body? As we ask questions, we also inspect documents (e.g., aged receivable reports) and make observations (e.g., who collects the payments?). If controls weaknesses exist, we create audit procedures to respond to them. For example, if—during the walkthrough—we see inconsistent allowance methods, we will perform more substantive work to prove the allowance balances. Third, consider the directional risk of accounts receivable and revenues. The directional risk for accounts receivable and revenue is an overstatement. So, in performing your audit procedures, perform procedures to ensure that accounts receivables and revenues are not overstated. For example, review the cutoff procedures at period-end. Be sure that no subsequent period revenues are recorded in the current fiscal year. Audit standards require that auditors review estimates for management bias. So, consider the current year allowance and bad debt write-offs in light of the prior year allowance. This retrospective review allows the auditor to see if the current estimate is fair. The threat is that management might reduce allowances to inflate earnings. Moreover, the audit standards state there is a presumption (unless rebutted) that revenues are overstated. Therefore, we are to assume revenues are overstated, unless we can explain why they are not. Fourth, think about the risks related to receivables and revenues. Risks related to revenue also vary from company to company. For example, one telecommunications company might sell bundled services while another may not. Revenue recognition is more complex (risky) for the company selling bundled services. Also, revenue risks vary from industry to industry. For example, the allowance for uncollectible is normally a high risk area for healthcare entities, but may not be so for other industries. Fifth, think about the control deficiencies noted during your walkthroughs and other risk assessment work. Sixth, now it’s time to assess your risks. In smaller engagements, I usually assess control risk at high for each assertion. Controls must be tested to support any lower control risk assessments. Assessing risks at high is often more efficient than testing controls. When control risk is assessed at high, inherent risk becomes the driver of the risk of material misstatement (inherent risk X control risk = risk of material misstatement). The assertions that concern me the most (those with higher inherent risks) are existence, occurrence, and valuation. So my RMM for these assertions is usually moderate to high. My response to higher risk assessments is to perform certain substantive procedures: namely, receivable confirmations and tests of subsequent collections. As RMM increases, I send more confirmations and examine more subsequent collections. Additionally, I thoroughly test management’s allowance computation. I pay particular attention to uncollected amounts beyond 90 days. Uncollected amounts beyond 90 days should usually be heavily reserved. And amounts beyond 120 days should—generally—be fully reserved. Next, we’ll see how to audit investments. Excellent post Charles. You provide a logical and practical approach to auditing receivables/revenues. I recently received a peer review update from the AICPA which made it clear that peer review will be focusing heavily on proper risk assessment from planning to the audit program through the procedures. Auditors would do well to follow your straight forward approach. Thanks again! Yes, Fausto. The AICPA is definitely leaning into risk assessment. Thanks for your kind comments. Thank you, Charles, for your informative and educational post. Well written post, I found this post through a google search when trying to get other perspectives on applicable risks to the accounts receivable process. I appreciated the very straightforward comprehensive, but precise focus on the subject. I am working on improving various audit programs I utilize and how I structure work papers and this article helps me understand relevant risks and areas of consideration for accounts receivable. Thanks for the kind words, Maggie. I am so glad you found it helpful. Have a good day.